Marriage includes not only delights and endless bliss, but also everyday responsibilities, which can significantly reduce romance and passion in a couple’s relationships. 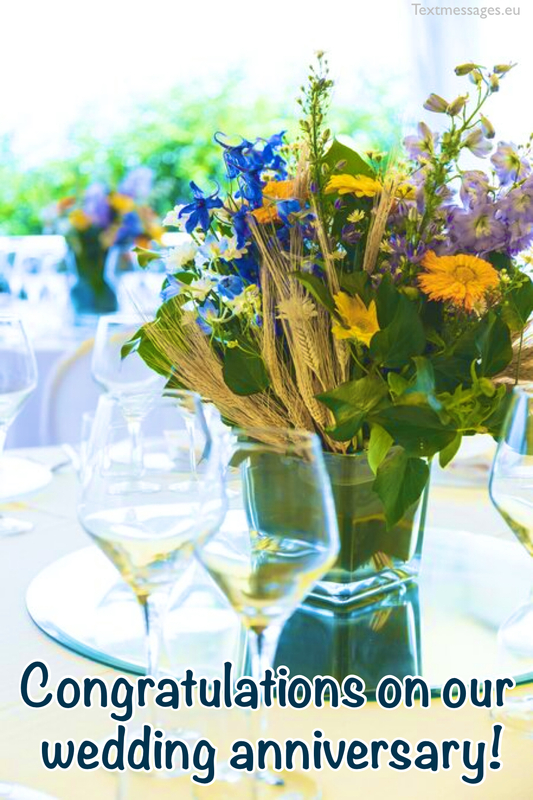 The wedding anniversary is a great occasion to rekindle the romantic bond between husband and wife. 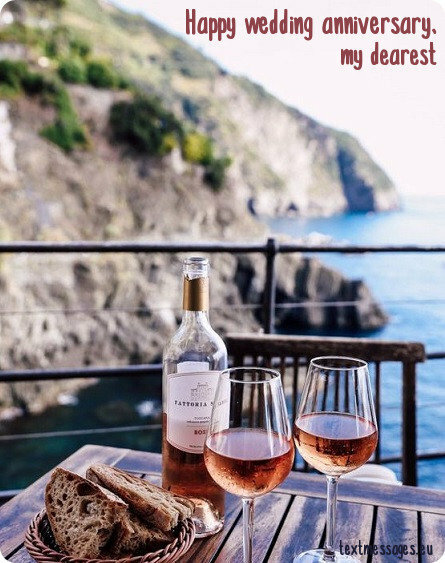 So show your feelings, send one of nice wedding anniversary wishes for wife as well as beautiful images and cards with greeting messages presented on this page. 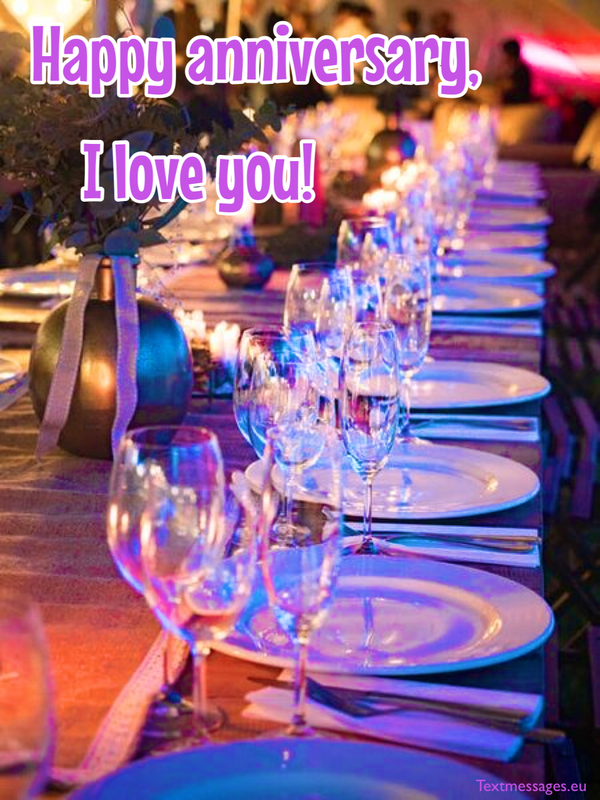 And don’t forget to surprise her with a gift and take her out, be the most romantic man in the world! I don’t know what I’ve done to deserve it, but my amazing wife is just an angel sent from heaven. Living together with you is paradise on earth and I don’t want this to stop. Ever. Congratulations on our wedding anniversary! No one else would understand our wonderful relationship and no one else in this world would understand me the way you do. Love stories are beautiful, but ours is my favourite. Happy anniversary darling! The best and happiest thing about having forever is you, my dear. Together, we will always have friendship, joy, laughter and stability. I love you. 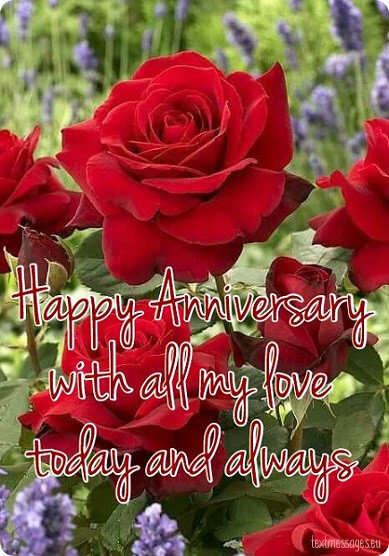 My lovely wife, being with you makes me feel like our anniversary is every day. I have been happy and blessed with you by my side. I cherish you and I will always do. Happy anniversary darling! Today reminds me that God truly loves me, for he gave the most amazing woman and chose her to be my life partner. I won’t stop being grateful. Happy anniversary dear! I am the luckiest for having such a wonderful woman that completes my life, a woman that makes my day from when I wake up till I sleep at night, indeed you are my better half and I will always love you! All the best words in this world are not enough to describe how much I am deeply in love with you, from the first time I saw you until the sweet love you have shown me. You are not just my love, you are my soul. Happy anniversary sweetheart! Today is our day, so let us celebrate it like there’s no tomorrow! I love you very much, and I know we will be together forever! 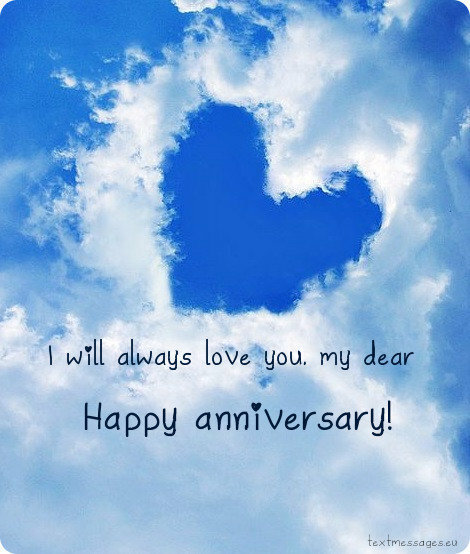 I can’t live without you, just like a bird can’t fly without its wings, I love you very much, happy anniversary my sweet! My wife, the way you hug me, the way you hold my hand, all my worries stay away from me because they know I have you. I love you baby and I won’t stop. Happy anniversary! I like to lie in our bed, wide-awake, and think how lucky I am just to have you by my side, turn to my side and hug you! I love you sunshine, happy anniversary! 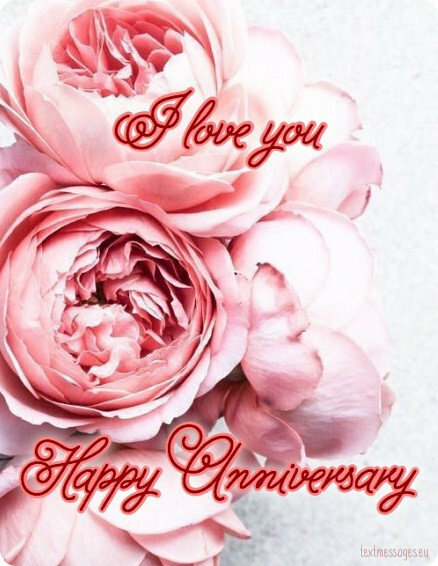 I love you, and I always did, even when we fight, and I yell : “Leave me alone” I don’t mean it, I never do, because you are my everything and if you leave, I won’t have anything left… Happy anniversary! We have been happily married for 10 years, and I know, I used to forget our anniversary very often, but today is very special, it’s been 10 years… just let that sink in… We used to fight, laugh, cuddle, and you know, it was all worth it. I know we had our ups and downs, but even though we fight, look at us now, we are stronger than ever, and we made it to another anniversary! I love you baby! I like waking up and looking at the your amazing eyes every morning, it makes me feel very special, just by looking at you, I can tell you feel the same way, it’s been 5 years, and look at us now! Happy anniversary baby! It’s been ** years since we first met, and now look at us, you are the one I want to place in my heart, because without you, I would not be complete. Happy anniversary honey! Sometimes love, relationship begins and ends, but I’m sure that we will be together forever and always! A bird can’t fly without wings but I can’t even imagine my life without you. Happy 1st anniversary day, my sunshine! One year has passed but I will never forget that moment in my life when you said YES. I’m so happy my darling, you make my life complete! If someone told me long ago that I would be the happiest man on the planet, I wouldn’t believe it, because there’s only a slight chance that I would meet someone like you. I should consider myself the luckiest man and cherish every moment with you. 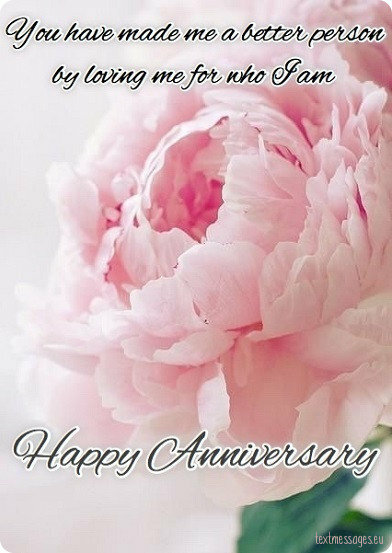 Congratulations on our wedding anniversary, my beloved wife! I believe that in every lifetime I’m supposed to live I would be searching for you. And when I find you, I will do everything it takes to be together with you and make you happy every single day. 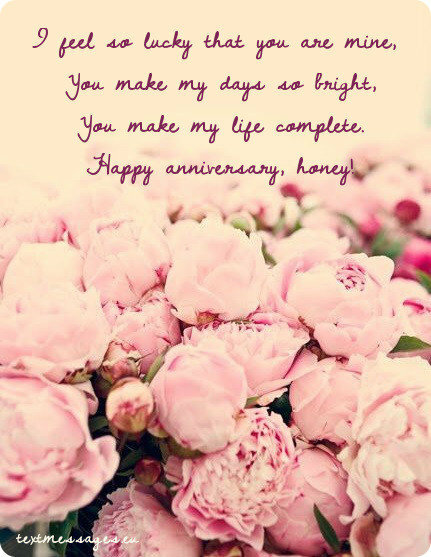 Congratulations on our wedding anniversary, honey. I have always been skeptical about fairy tales, but how can I be skeptical now, when I live in a one? You made it possible and I will never forget what a great magician you are. Love you, honey, and wish both of us an amazing wedding anniversary day! There are some things that people can’t see with their eyes: love, happiness, gratitude. But these things are easy to feel if you have a gentle soul. Thank you for letting me see the invisible, you are the best wife ever. Congratulations on our wedding anniversary! 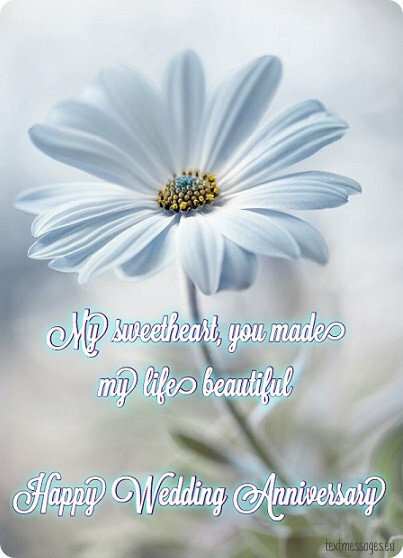 My dear, thank you for sharing your wonderful love with me, you are my whole world. Happy anniversary sweetheart! I have never thought it’s possible to preserve true feelings after all these years of married life. But you proved otherwise. You proved that love exists and that we’re a perfect match. Thank you for everything and congratulations on our wedding anniversary! Did you know that on the average there are around 200 sunny days in a year? Well, maybe for the rest of the world it’s true, but according to my statistics, there are 365 sunny days in a year. You know why? Because I have my personal sun that shines for me every day, and it is you! 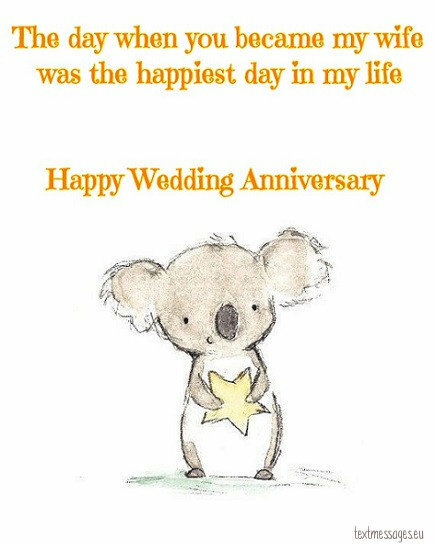 Congratulations on our wedding anniversary, honey! If you ever thought about divorce, you ought to forget it, because I will never let you go. You are the most amazing woman in the world and it would be such a shame for me to lose such a precious diamond. I love you, sweetheart, and I wish both of us to enjoy this amazing wedding anniversary day in full. Sometimes love comes from where you don’t expect it to come… Who knew that after so many years in marriage I would learn to love again. Honey, I must confess that I fell in love with the most beautiful, intelligent and charming woman I’ve ever met. And this woman is my wife. Congratulations on our wedding anniversary! Ever since you became my wife, I wake up with a smile, my life is filled with colours of love and I feel so alive, thank you for coming to my life. Happy anniversary, my beautiful wifey! I always thought that making the same mistakes was my curse. And here we go again! I can’t help but falling in love with you over and over again. And I wish it would never come to an end. I promise you that today we are going to have the most magnificent wedding anniversary day ever. I was the happiest man on the whole planet when you said “Yes” on the blessed day of our wedding. Believe it or not, but this simple word always inspired me and cheered me up in the hardest times. You are my hope and I will hold on to you until the very end. Congratulations on our wedding anniversary, sweetheart! We’ve been married for years, but it feels like we got engaged only yesterday. Time flies so fast that sometimes I even get scared that I won’t ever get enough from you. 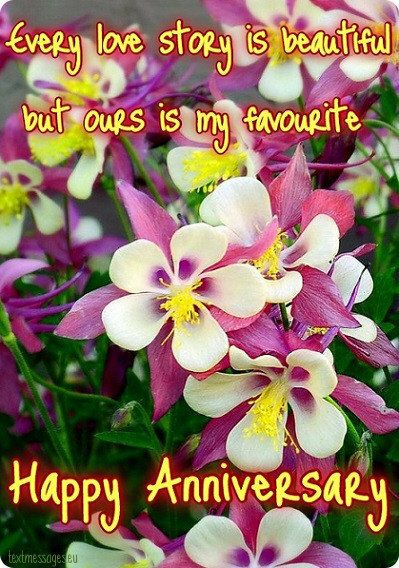 I love you, honey, and wish both of us an unforgettable wedding anniversary day! Some people don’t believe in a happy marriage, but I’m nothing like them at all, because I don’t believe in an unhappy marriage. All these years we spent together, loving each other and caring about each other and I can’t imagine it any other way. Happy wedding anniversary day to us! If I am a song, then you are the rhythm and we are the melody for a long time. Thanks for the great years we have spent together and for much more to come. Happy anniversary my love! Despite we’ve been married for years, I didn’t manage to solve your riddle. You’ve always been so mysterious and magnetic… Just like on the day we first met. You will always be a charming magician that casts a spell on me. Happy wedding anniversary, honey! I know for sure that true love exists only because of you. Even in the darkest hours, you managed to find some light for me. You managed to love me even when I was some other person, some bad person. That what true love means to me. Happy wedding anniversary day, my darling. There are only a few things I’m able to stare at forever: the flame, the starry sky and your perfect face. You are the love of my life and I won’t bear losing you. I promise that today will be one of the best days in our lives – our wedding anniversary day! If the whole world was about to disappear, I would beg god to save you. I love you so much that I won’t stand losing you. 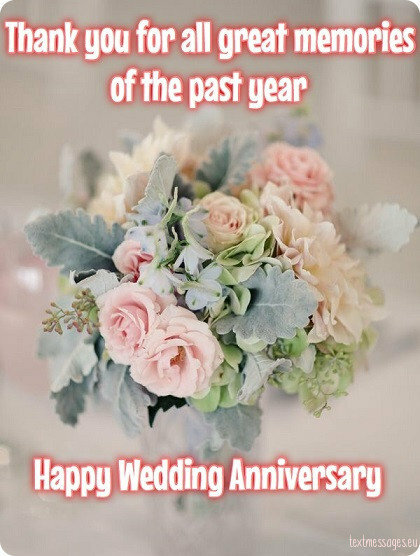 I wish you and me an amazing wedding anniversary! You were always like a gentle flower that needed much care, attention and love. And I was always happy to give you it all, because I saw my life purpose within it. You are my beloved wife and it will never change. Congratulations on our wedding anniversary, sweetheart! If I was a painter, the only thing I would be drawing for my entire life would be your pretty face. If I was a songwriter, the only song I would write over and over again would be the song about you. But I’m an ordinary man and all I can do is repeat how much I love you. Congratulations on our wedding anniversary! Sometimes we fight, sometimes we misunderstand each other, but eventually everything falls right into place, because we love each other. I wish both of us just a little more patience and an amazing wedding anniversary day also! If the whole world turns its back on me, I know there is one person who always loves me and accepts me the way I really am. And this person is my beloved wife. Thank you for your love and your patience. I wish a wonderful wedding anniversary day to us. Previously I was a man who couldn’t handle a woman, but with you everything was just so easy and fun. I can’t help but love you more with every passing year, my beautiful wife. Happy anniversary! Sometimes I really wonder why such an amazing woman as you stays with such an ordinary man like me. And it only makes me love and appreciate you even more. Congratulations on our wedding anniversary, honey! Don’t believe me when I say I love you, because it’s not exactly what I mean. What I really mean can’t be expressed in any kind of way, it’s invisible, it’s untouchable, but I truly believe you can feel it. 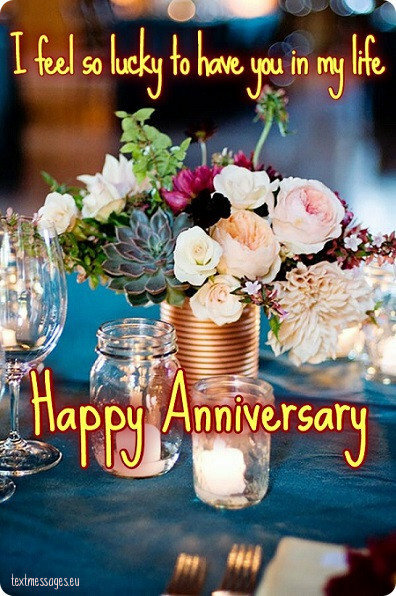 Congratulations on our wedding anniversary, honey! Even though so many years have passed since the day we got married, I still can’t believe that you are my wife. It still looks like an unbelievable miracle to me. 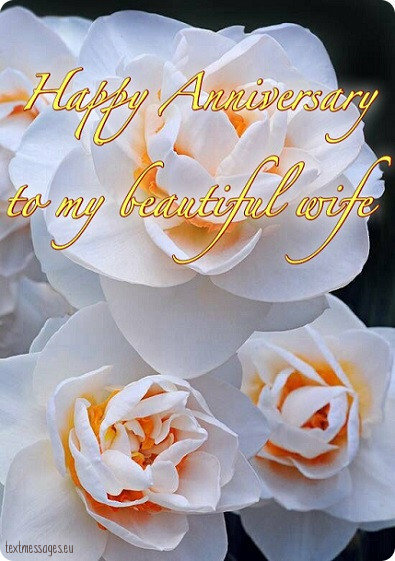 I love you, honey, and wish you a beautiful wedding anniversary day! I’m starting to think about a divorce, because my love for you drives me crazy every single day. Is there any cure for such kind of a disease? Well, I believe one angel kiss from you will help it. I wish a magnificent wedding anniversary day to us and I promise to make it really great! P.S. Forget about the divorce, just be mine forever. My dear wife, you will always be in my heart, because it beats only for you. With you, I’m the happiest man on this earth. Thank you for the previous years, let’s do it again. Happy anniversary, sweetie! I won’t ever stop telling you how beautiful you are and how much I love you. Because you are the one I’m living for, you are my everything. I love you endlessly and wish you a wonderful wedding anniversary day! We’ve been through many things together. And every time we proved ourselves as faithful, loving and supporting spouses. I don’t believe things can be any better and I’m truly grateful to you for everything I have in life. Congratulations on our wedding anniversary! The mankind hasn’t invented the language that can describe your beauty, but I’m the one who will never stop trying to express your majestic beauty and I hope someday I will succeed, despite my poor language. Congratulations on our wedding anniversary, sweetheart! You were a heaven gift sent from above and I were a sinner who didn’t deserve it. I should consider myself lucky, because the most amazing woman on the planet chose to be mine. I will never forget it. I wish a really wonderful wedding anniversary day to us! You are my wife and I am your husband, but I still remember how we fell in love a long time ago. These memories warm my heart and remind me about how lucky I am to have you as my beloved spouse. 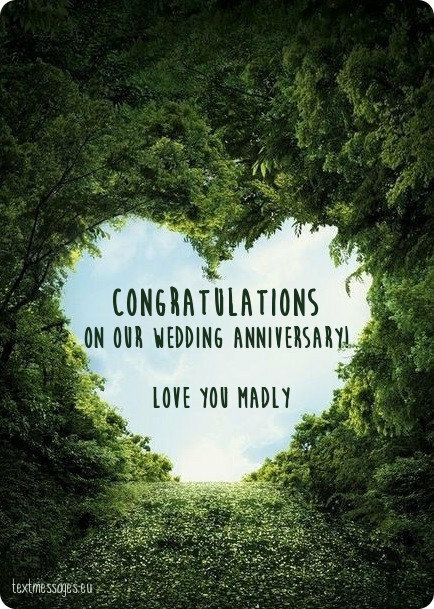 Congratulations on wedding anniversary, honey! If I was going to say, whether I appreciate love or friendship more, I would not be able to choose any of them, because both of them embody in one person – it’s you. You are my friend, you are my lover and my beloved spouse. I love you, sweetheart. Congratulations on our wedding anniversary! Even though so many years have passed since the day of our wedding, I wake up every morning, see your divine face right next to me and can’t believe what a lucky man I am. You are my happiness and my love, and it will always be this way. 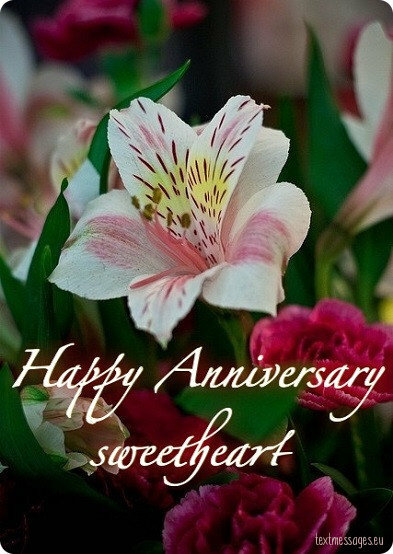 Congratulations on our wedding anniversary, honey! Every time I want to finish my work earlier because I know that you will be waiting for me when I come home. Knowing that you are waiting for me is the best reward after a hard day’s work. It gives my life sense and purpose. Congratulations on our wedding anniversary! Sometimes I get so tired that I can’t even sleep. But you always know how to calm me down and sing me to sleep. There are some things you know better about me than I know them myself. And I will never stop thanking you for that. 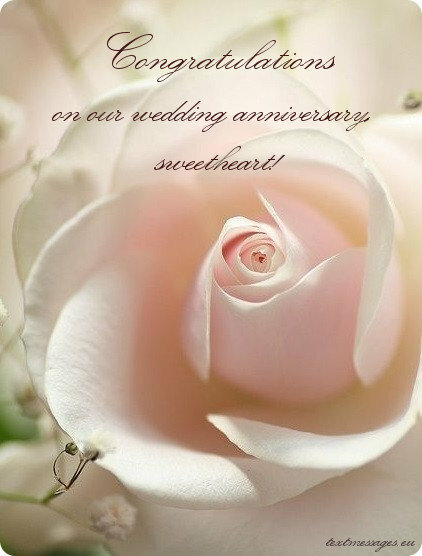 Congratulations on our wedding anniversary, honey! Every wedding anniversary reminds me of the day of our wedding. We were so young and so in love. And it warms my heart to know that we still love each other, despite we grew older. Happy wedding anniversary day to us! My dear wife, every time I think of you, my heart starts beating faster, just like on the day I first saw you. You seem to have cast a love spell on me and I don’t think I’ll ever break free from it. And I don’t really want to. Congratulations on our wedding anniversary! The biggest happiness in the world is to have a faithful, loving and understanding wife. And this is exactly the kind you are. I love you and wish an amazing wedding anniversary day to us! My love, today is our day, so let’s celebrate. For we are given one more year to love, care and cherish each other. I will always love you, my dear. Happy anniversary! I don’t know what I have done to deserve such a wonderful wife as you are. But I definitely know what I should do to keep you by my side. I should give all my love to you. And I promise I will. Congratulations on our wedding anniversary, my dear wife. If you weren’t my wife, I believe nobody would be. You are the only one for me and I don’t need anybody else. I wish you an amazing wedding anniversary day, my darling. 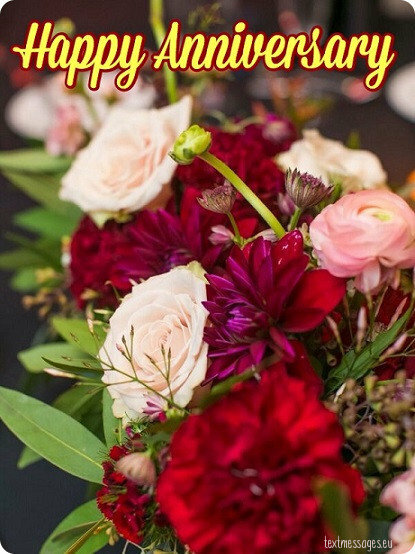 Dear wife, today is my favorite day of the year. It always reminds me that I am the luckiest and the happiest man in the world, because I share my life with such an amazing woman as you are. I pray to God it would continue this way. Congratulations on our wedding anniversary! I have never thought that family life is so unbearably… astonishing! And this is all because of you. You’re the most understanding, tender and yet strong and optimistic woman I’ve ever known. Together we can do anything, because our love makes us undefeatable. Happy wedding anniversary, sweetheart! You know, after all these years living together, I realize that if I had a chance to change everything, I would never take it. I will always choose you, my dear wife. Congratulations on our wedding anniversary! Maybe I’m too naive, but every time I see a shooting star I make the same wish. This wish is to be with you until the very end. The stars haven’t failed me yet and I hope they proceed fulfilling my wish. At least I will do my best to deserve it, I promise. Congratulations on our wedding anniversary, honey! My favorite color is the color of your eyes. My favorite music is the sound of your sweet voice. I love every tiny thing about you. And I’m glad I’ve managed to maintain my deep love for you throughout the years. 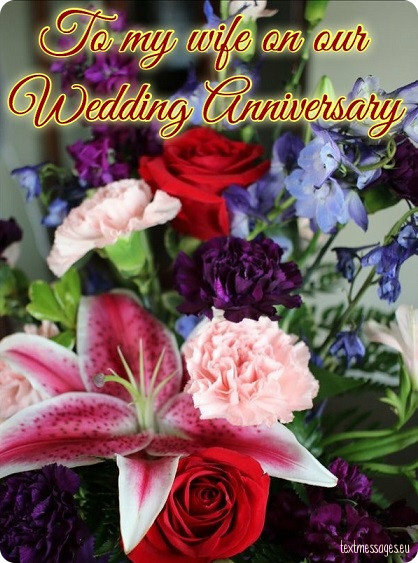 I wish you and me a wonderful wedding anniversary day! You give me hope and comfort. You love me no matter what. You make me want to be a better person. It’s amazing how our lives changed on the day of our wedding. And they changed for the better! Happy wedding anniversary day to us! I don’t know how but you always knew what was best for me. You always guided me and showed the right way. You’re not just my wife, but my best friend, and I’m extremely proud of it. 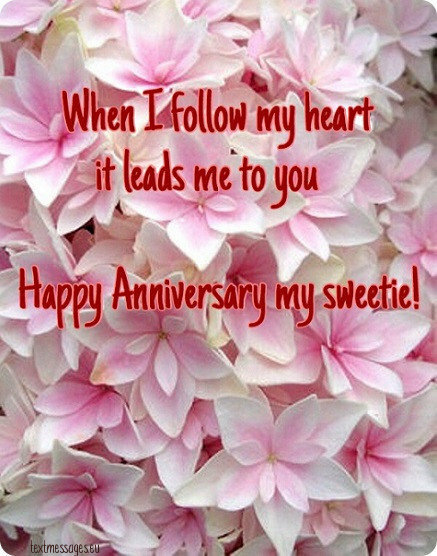 I love you, honey, and wish both of us a happy wedding anniversary day. You taught me many things. You taught me how to love and how to be happy. It means a world to me, honey, because now I feel complete. I will never let you go and I will do everything it takes to make you happy. Congratulations on our wedding anniversary! I know that I’m not perfect and sometimes it takes a lot of patience to bear me. But surprisingly I always find you by my side, loving and supporting. You are the best, honey, and I will never stop telling you this. Happy wedding anniversary! I always dreamed of spending my life together with you. And when this dream came true, I couldn’t believe it. It’s so amazing that I will never stop wondering what have I done to deserve you. Happy wedding anniversary day to you, my darling. Sometimes I regret I can’t live forever. If I had all eternity in my possession, I would definitely share it with you. You make my life full and happy. I wish I could do the same for you. 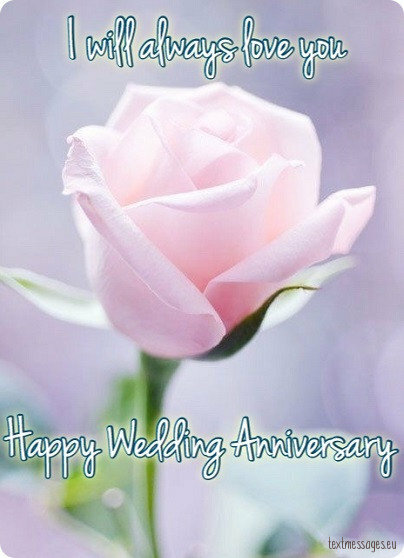 Happy wedding anniversary day to you, honey! I am so happy to have someone who loves, take care, supports and understands me. I am glad you are the most wonderful person to be my life partner. Happy anniversary my dearest! We are two parts of one soul, we were created to be together. The more I look at your angel face, the more I’m getting convinced. The longer we are together, the more I’m falling in love over and over again. You are an amazing wife and I will do my best to be the best husband for you. Happy wedding anniversary! We can never know what the future holds for us. The best we can do is love each other and care about each other. 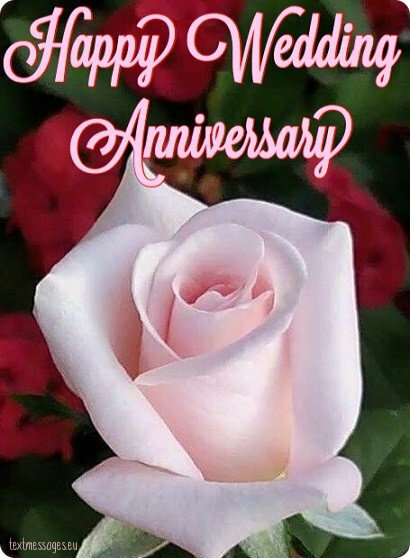 I love you, my dear wife, and I wish you and me a beautiful wedding anniversary day! Before I met you I thought that love is just a beautiful fairy tale for little kids. But now I know that it’s not true. You gave me a life full of love and happiness, I want to thank you for that. Happy anniversary, darling! I used to think that living with someone was not for me. But then I met you. You fulfilled my life with sense, and I’m so grateful for that. I love you to the Moon and back. Happy anniversary, my beloved wife! You are the most amazing woman I have ever known and when you finally became my wife, all my sorrows were blown away. I love you so much! Happy wedding anniversary, my dear! Marriage is hard. That’s what everyone keeps talking about. But it’s not about us, because waking up with you every day is the most amazing thing in the world. God bless the day I met you. Congratulations on your anniversary, baby! Baby, I cannot even find the words to describe how much you mean to me. You are the Sun of my life, I can’t live a day without your everlasting light. Everything I do, I do for you. God bless you, happy anniversary! Anniversary is the day when you cannot believe that it is possible to love someone for so long. But you have to believe. Because my love for you is everlasting. Thank you for being with me through all this time. Happy anniversary! The first time ever I saw your face I realized that we will spend our lives together. You are my first love, and I cannot compare this amazing feeling to anything. Thank you for being you. Congratulations on our anniversary! From a boy you turned me into a man, for me, you did everything best which you could and can. Thank you so much, darling. Happy wedding anniversary! I won’t lie, being with you is such a roller coaster. We have our ups and downs, but in the end it doesn’t matter because we love each other so much. It helps us to cope with everything. Love you unconditionally, happy anniversary! Love is complicated. But you make it so much easier. 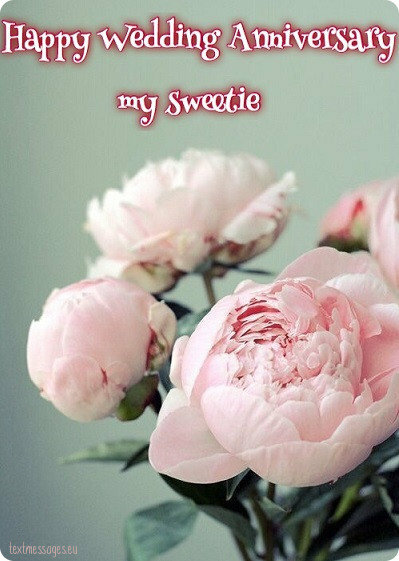 Your ability to make my each and every day special is something that still surprises me. I want to thank you for everything you do for me, it’s precious. Happy anniversary, baby! My love for you is something that will last forever. Each and every year I feel so lucky to congratulate you with our anniversary, you cannot even imagine. You are my everything, love. Congratulations on our anniversary! Love is something that keeps us together through all these years. I used to think that it’s impossible, but you’ve showed me the different side of it all. God bless the day we met each other. I love you so much, happy anniversary! My love, I was searching through every bit of the dictionary to find the true meaning of life and I found nothing. But when we met and got married, I found everything. I love you dear. Happy anniversary! Everyone keeps asking when I realized that I love you. I cannot answer that question. I feel like love for you have always been somewhere within me waiting for a moment to bloom. You have made my life so much better, I love you so very much. Happy anniversary! God blessed us with a miracle of love. I could not be happier, you know that. My love for you is everything I have and I do my best to show you how much you mean to me. Love you to the Moon and back, congratulations on our anniversary! There are millions of people living their lives here and there. But somehow you have found me, and we are here, celebrating our anniversary. It’s insane. I love you so much that it hurts, don’t you ever leave me. Happy anniversary, pumpkin! When we got married I felt like the happiest man in the world. I thought nothing could be stronger and bigger than this feeling. I was wrong. Now, when we’re celebrating our anniversary, I’m even happier cause it means that I’m lucky enough to still be with you. Happy anniversary, baby! Here comes a beautiful rose for the most beautiful woman in my life, thank you for giving me a beautiful life. Happy anniversary my love! My father once said that I have to be careful when it comes to choosing a wife. And I was. I’ve made a right choice, now I’m sure about that. I love you like I’ve never loved anyone. You are everything to me. 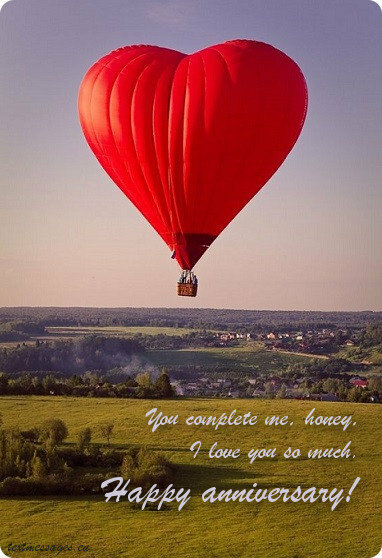 Congratulations on our anniversary, honeybee! There is no one as beautiful as you are. There is no one as smart as you are. No one as funny as you are. Everything about you is so special and unique, I cannot find the words to describe how amazing you really are. I love you endlessly. Happy anniversary, darling! Some people wake up thinking about a cup of morning coffee. Some people think about work they have to do. And I always wake up thinking of you. I love you so very much, and it is permanent. Congratulations on our anniversary, my dear! Loving you is easy because you are perfect in every little thing. Your eyes, your lips, your hands – I love everything about you. The day we got married is my favorite day of the year, and I want to congratulate you on our anniversary. You are the best. Love you. You are my everything. I tell you that each and every day, but I will never get tired of repeating those words. I love you more than anything and anyone in the world. 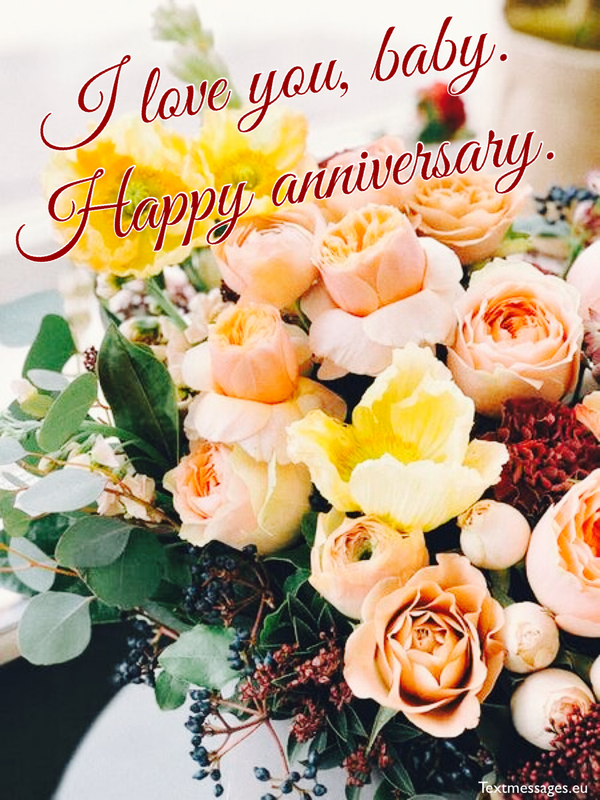 Congratulations on our anniversary, honeybee! To love somebody like you is a blessing. All of your imperfections make you so special and amazing, sometimes I just can’t take my eyes off you. You are the love of my life. Happy anniversary, my dear wife! If I could I would buy you the whole world. But I know that you don’t need it. All we need is us loving each other till the end of time. God bless the day of our marriage. Love you unconditionally. 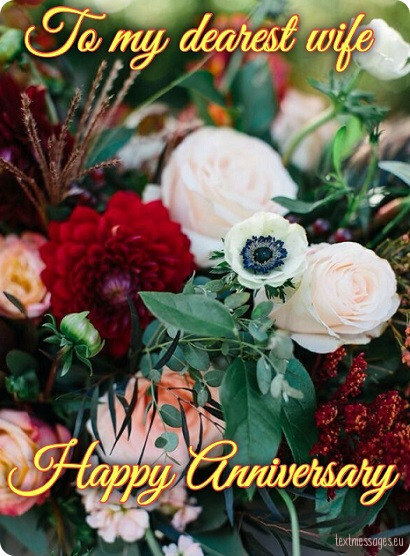 Congratulations on our anniversary, honey! I have never thought that someone like you can fall in love with someone like me. You are the most amazing woman in the world. Your beauty and intelligence complement each other so well, and I feel so blessed to be by your side each and every day. Every love song is about us. You make my life so special and beautiful, I have absolutely nothing negative to say about you, it’s amazing. You are extraordinary. Love you to the Moon and back, congratulations on our anniversary, baby! I used to think that marriage was not for me, but then I met you. You showed me what love is; I know you are the one. I appreciate and love you so much it’s unbelievable. Thank you for everything. Happy anniversary, darling! We’ve been through a lot of stuff together, haven’t we, babe? But it only has made our relationship stronger. You are the woman I want to see every morning when I wake up. Love you so very much, happy anniversary! Sometimes we have problems. Sometimes we fight and scream at each other. But it means nothing as long as you love me. I will do anything for you, and I know that you feel the same about me. You are my everything. Happy anniversary, honey! You are the reason I wake up every day. You make my life so much better with your presence in it, and I want it to be like that till the end of time. God bless the day we got married. I love you so much, happy anniversary, baby! I would give up everything for you. I have never felt this way about anyone, you know that. On this day I promise you to do my best to show you how much I love and appreciate you. 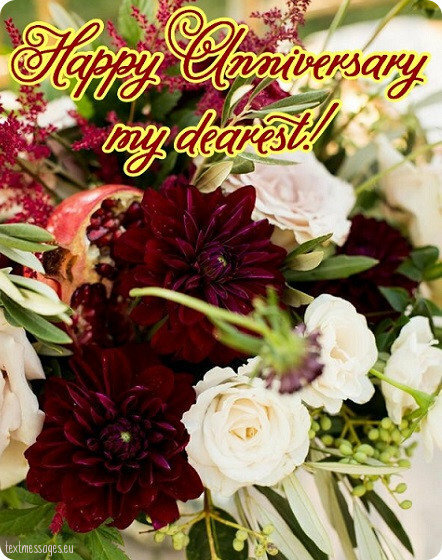 Congratulations on our anniversary, honey! Life with you is a fairy tale. You are truly the other half of me, this is the only way to explain why I feel so comfortable being with you 24 / 7. The way you make me feel is indescribable. Love you so much, happy anniversary, baby! Living with you sometimes can be hard. You like to control everything, and I don’t like to be controlled. But you are the only person I allow that, because I love you so very much. You are my everything, baby. Congratulations on our anniversary! You are the angel who got lost in this crazy world. But I was lucky enough to find you before anyone else, and to be here with you is the biggest blessing I could ever receive. Congratulations on our anniversary, darling! The Sun shines just for you. The stars fall because they want to be closer to you. The Moon waits the whole day to see you. And I’m just a man who is lucky enough to have you by my side 24 / 7. I will do everything to make it last forever. Love you so very much, congratulations on our anniversary, baby! You light up my world with your smile. You make me laugh so hard when I don’t feel like laughing at all. You just make me a better person, and I am so extremely thankful for that. You are the best. Congratulations on our anniversary, baby! If you ask me what star is the brightest, I immediately reply: you. You are the Sun of my life, and I will do everything to have you forever. I love you like crazy, and I know you love me too. Congratulations on our anniversary! It was hard at the very beginning of our marriage. I didn’t know what to do, how to act, I was totally lost. But you are so smart and understanding, you’ve taught me everything. And now we are here celebrating our anniversary. I love you insanely, baby. Congratulations! When I’m with you I feel like the Sun shines brighter and birds sing louder. Everything makes sense when you are by my side. You are a true miracle, I love you so very much. Congratulations on our anniversary, darling! You have made my life so special and amazing, I don’t even know what to say or do to thank you for everything you’ve done to me. You are my woman, and I will do anything to be with you till the end of time. Love you endlessly. Congratulations on our anniversary, darling! You are someone I think about every minute. I can’t help it. You are my everything, love. Without you my life would be empty and pointless. I’m so grateful for everything you do for me. Congratulations on our anniversary, love! To propose to you was the greatest decision of all. I’m so happy that I have the opportunity to wake up next to you each and every day, to see your beautiful smile and feel your hand in mine. I love you to the Moon and back, don’t you ever forget that. Happy anniversary, baby! We share everything. Same house, same love, same believes. I cannot imagine my life without you by my side. You are everything to me. I love you like I have never loved anyone before. God bless the day we met each other. 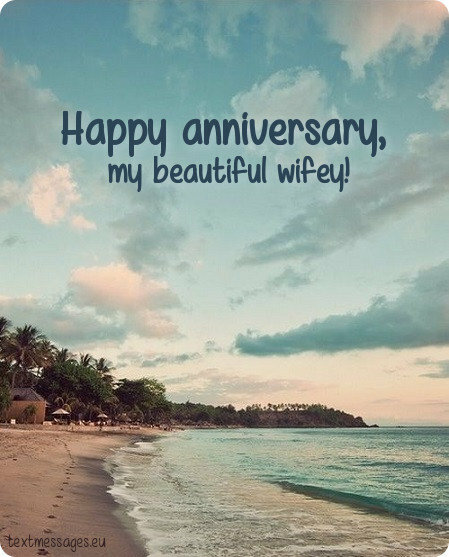 Congratulations on our anniversary, honey! My love for you is so big I can’t even find the words to describe it. I feel it with every inch of my skin, it makes my heart beat faster and brings so much joy in my life. I’m so happy to celebrate our anniversary here with you. Congratulations on our anniversary, darling! I love you so much that sometimes I ask myself: is it even possible for a human being to feel this way? This feeling is so strong and overwhelming that it can even hurt from time to time. You are the light of my life, baby. Congratulations on our anniversary! I fell in love with you the moment I saw you. Your beautiful smile lighted up my world, and now I just can’t live without this everlasting light. I enjoy every minute of our life together. Happy anniversary, darling! I know that it is important for you to feel protected and loved. I promise you that I will keep doing my best to make you feel happy. To love and protect you is my duty. It will never change. 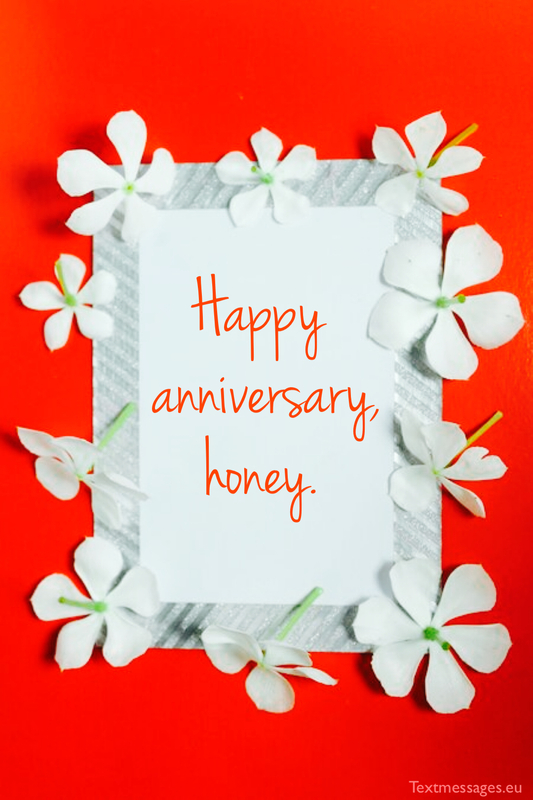 Congratulations on our anniversary, honeybee! 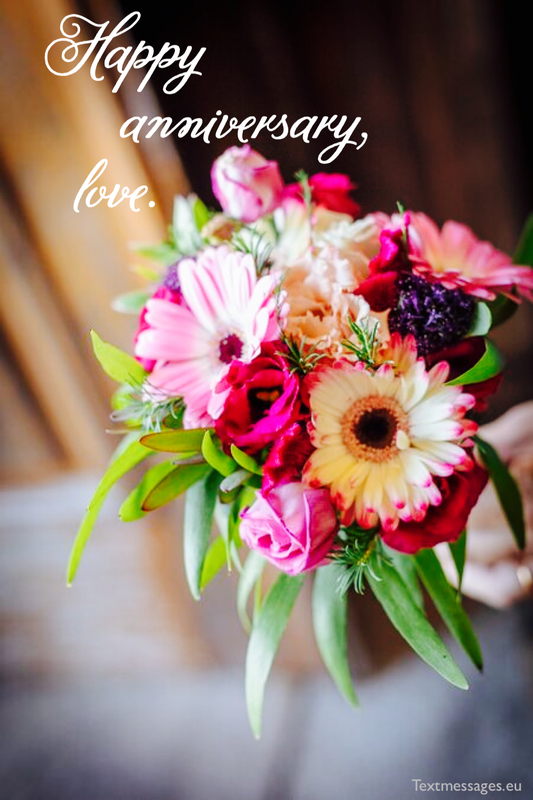 Marriage is nothing without love. I’m so happy that after all these years we still share this beautiful feeling, and I know that this is not our last anniversary. I love you so very much, baby. Congratulations on our anniversary! Being with you is a dream come true. You are such an amazing wife and mother, I have never met someone as loving and caring as you are. I will keep making you happy till the end of time. Congratulations on our anniversary, darling! Marriage is a huge responsibility. I have never thought that I will be able to live with someone for such a long time. But you are special, that’s why we are here right now. 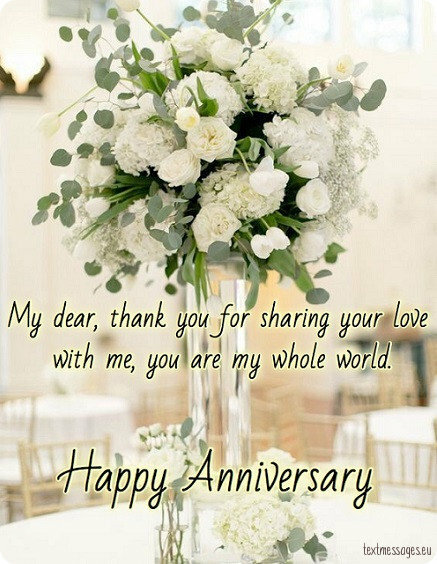 Congratulations on our anniversary, my beloved wife! People are complicated. It is so hard to find someone you can be with all the time. But I am the luckiest man on Earth, because I got you. You have made my life so special and full of happiness. I love you like crazy. Happy anniversary, baby! I know I’m not perfect, and sometimes it is hard to talk with me. I get angry from time to time, and you are the only person who knows how to calm me down. That’s why we are still together. We are a match made in heaven, baby. Congratulations on our anniversary! The best things in marriage are anniversaries, because each year you get surprised by the amount of time you’ve spent together. It’s absolutely insane, and I love it. You are the love of my life, baby. Congratulations on our anniversary!